Mary Thomas' second grade class during the 1961-1962 school year at Westside Grammar Elementary School. Freeman E. Baggett was the school principal during that school year. Students photographed include, from left to right: Gail, Toni Monti, James G., Christine, Alfred Greene, Aaron, and Patsy in the first row; Julie, Richard, Joe, and Judy in the second row; Glenda, Fred, Mary Jo, and Robin in the third row; Debra, Jane, Bernard, and Delores in the fourth row; and Skipper, James R., Jeff, and Terri in the last row. Original black and white photograph: Private Collection of Christine Kinlaw-Best. Kinlaw-Best, Christine. Interviewed by Mark Miller. UCF Public History Center, HAR 1063414P. March 2, 2013. Audio record available. UCF Public History Center, Sanford, Florida. Copyright to this resource is held by Christine Kinlaw-Best and is provided here by RICHES of Central Florida for educational purposes only. 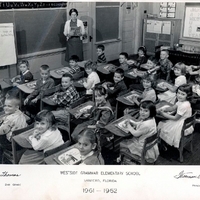 “Westside Grammar Elementary School Second Grade Class, 1961-1962.” RICHES of Central Florida accessed April 23, 2019, https://richesmi.cah.ucf.edu/omeka/items/show/1513.